I first sampled Paul Bartolotta’s cuisine at the American Wine & Food Festival a couple of years back, and was really impressed by some of the seafood he prepared. 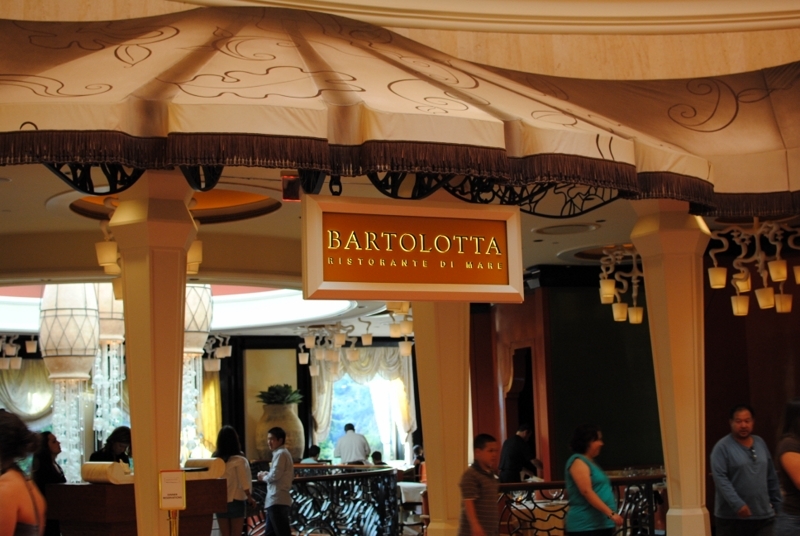 Specializing in Italian preparations of seafood, Bartolotta offers a ton of different fish and shellfish, line-caught wild and shipped almost every day. Most of the fish are available served whole family-style. 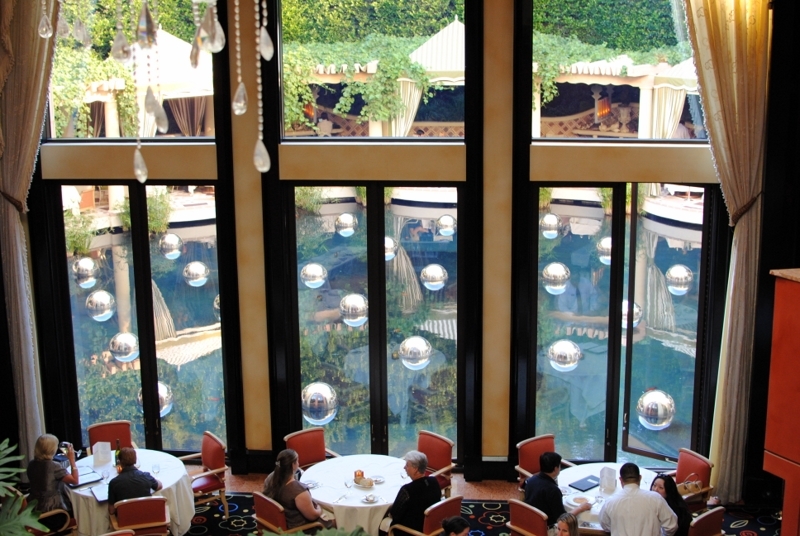 It seems everything that the Wynn does is very elegant and grand, and this two-level restaurant is no exception. 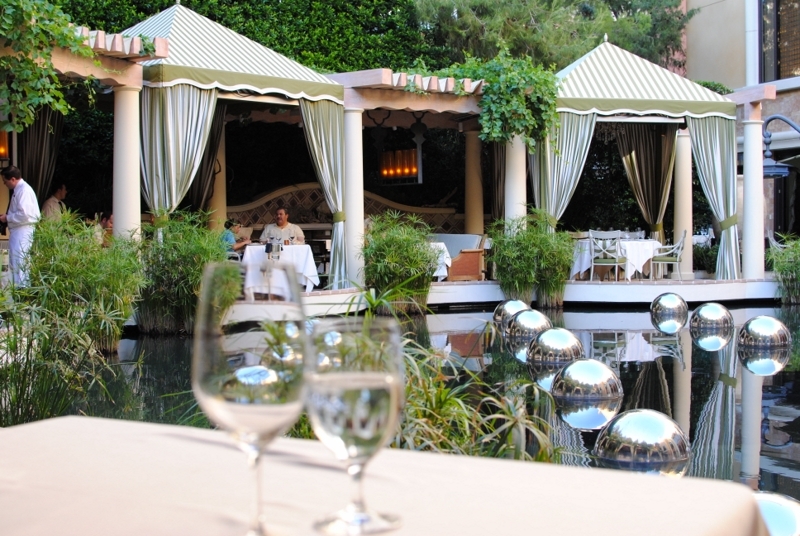 As you walk down the stairs, the main dining room is in view, as well as cabanas encircling the restaurant’s private pond. We sat at one of those cabanas, which may have proved to be a mistake, since it was blistering hot outside. We did not try any of their whole fish preparations, opting to sample more of their dishes a la carte. I love a seafood risotto, so this dish was a must. 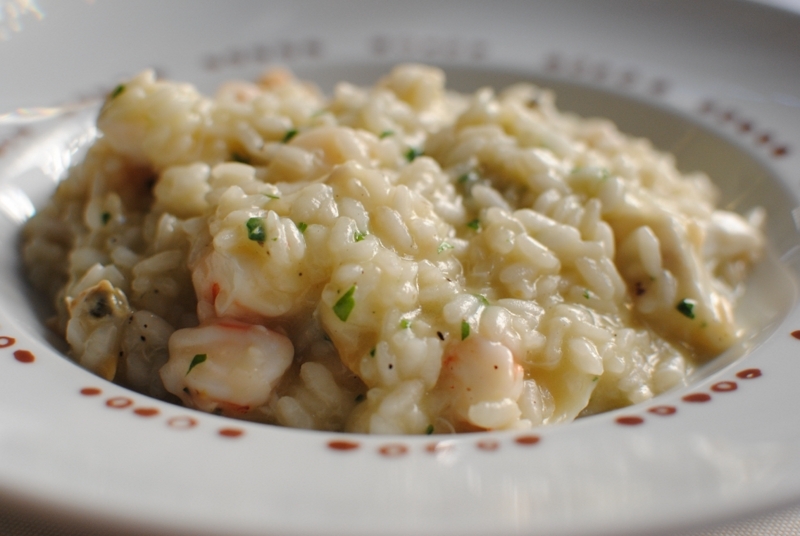 The risotto was creamy and al dente – just the way it should be. The seafood was plump and juicy, also cooked pretty well. A pretty good rendition of the dish in my opinion. This dish had a surprising amount of clams, as we had been told the appetizers were somewhat small. 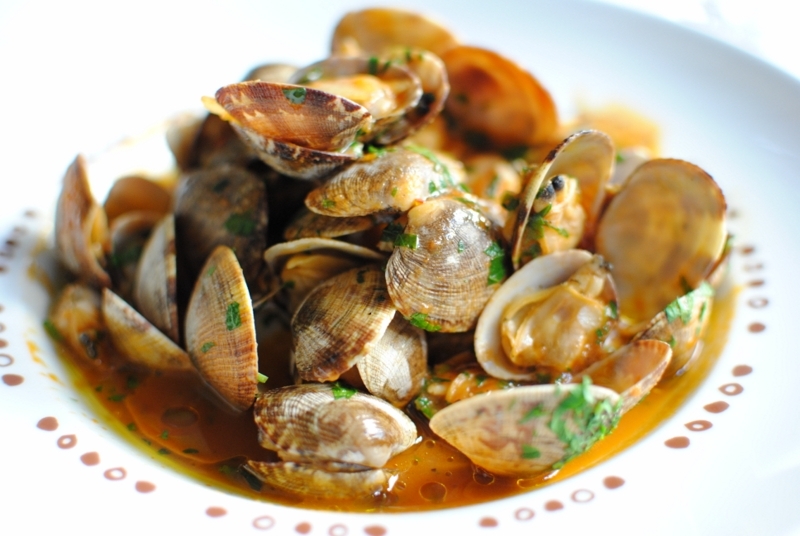 The clams were perfectly cooked, and the tomato-based sauce was light and flavorful. 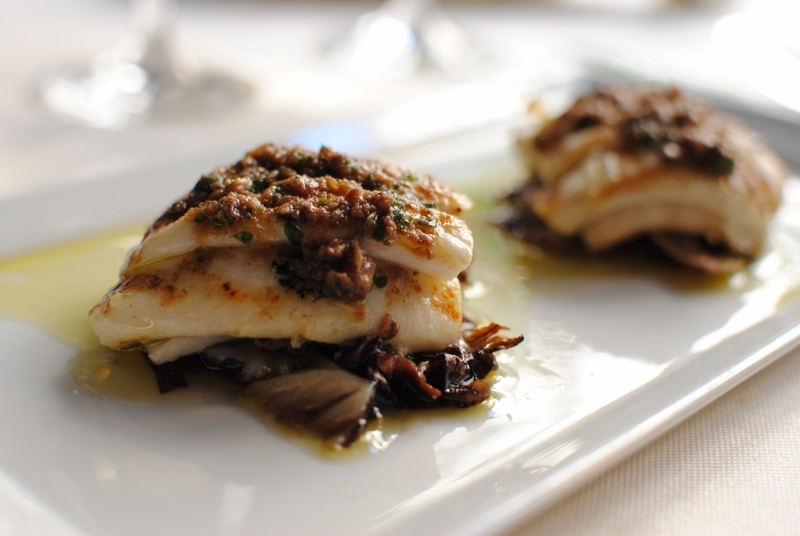 Bartolotta offers a number of fish, “simply grilled” as an appetizer. Here we have saberfish, nicely grilled and juicy. The restaurant consistently served some very fresh and well-cooked fish. The only dish we ordered with vegetables – the salad provided a lighter alternative, but wasn’t anything special. 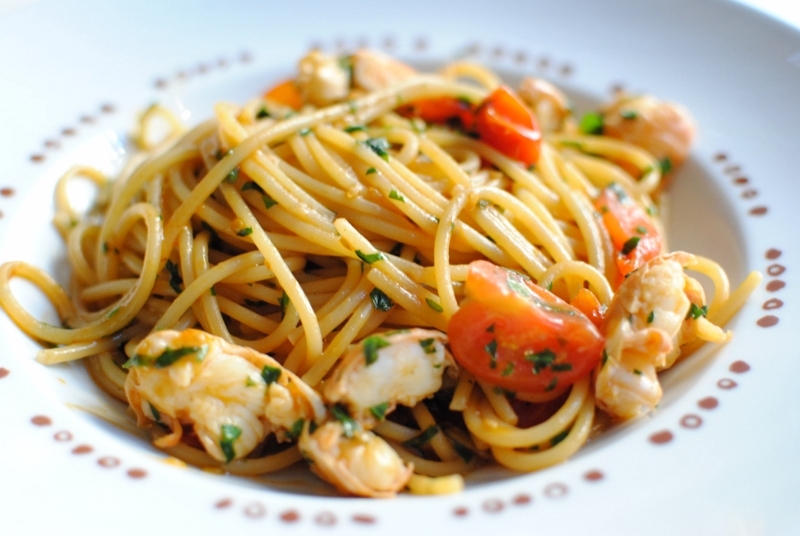 Pasta with seafood is something else I really enjoy – spaghetti with rock lobster? Why not? This dish was delicious. 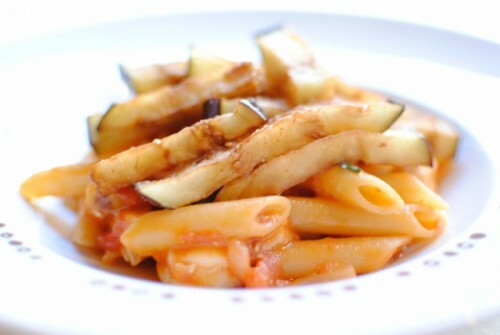 The pasta was cooked perfectly with a slightly spicy, light tomato sauce. The lobster was probably cooked a little more than I preferred, however, as they weren’t as plump and juicy as I’d expect. They were still good though. The crushed cherry tomatoes added a bright, fresh flavor to the pasta. Compared to the spaghetti, this dish was a bit of a letdown. The penne was not cooked quite as well (a little overcooked), and the eggplant and firm scorpion fish did not provide the same exciting, vibrant flavors. Bartolotta is a primarily seafood restaurant – make no mistake. But, they do prepare a very nice roasted chicken. The skin, all around, was superbly crisp. 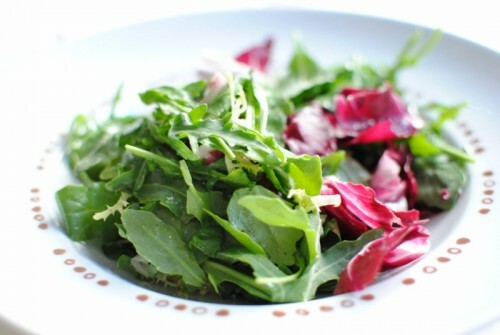 The meat was moist and flavorful, and the accompanying greens and herb sauce were a nice complement. The fish in this case was a Mediterranean snapper. 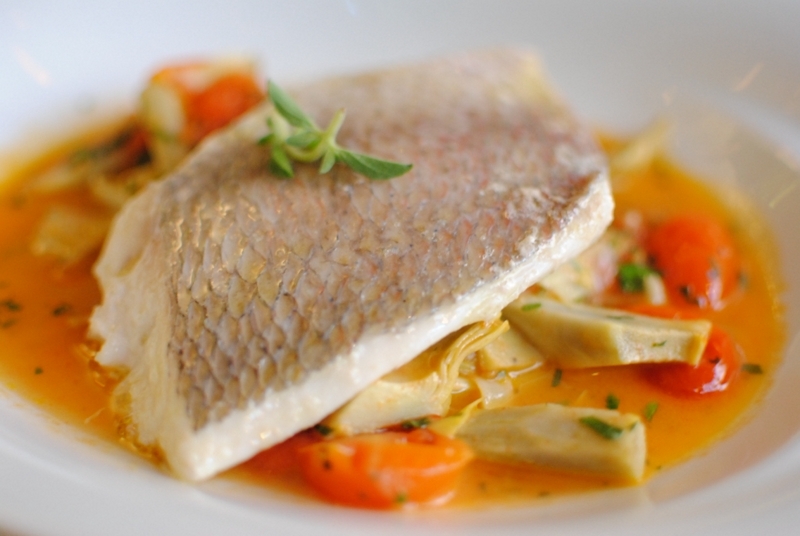 I love light, white fish, and I loved this dish. The fillet was really moist with a light and delicate flavor. The tomatoes and artichokes provided extra flavor, but were mild enough to not overpower this fish. A moist and tart lemon cake was topped with a rosemary gelato. 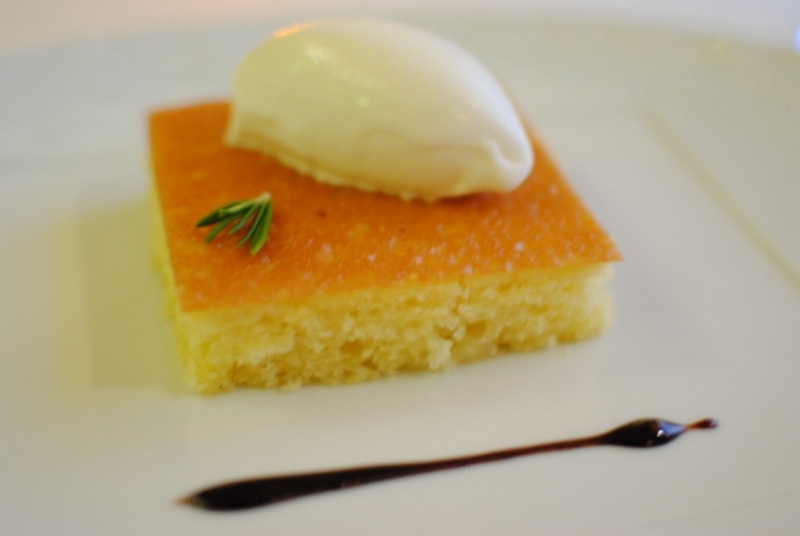 I thought the cake was nice, but the rosemary gelato did not stand up too well to it. A bite of every component was largely flavors of the lemon and balsamic. 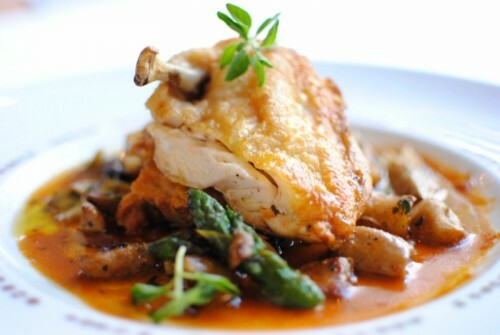 In all, I was pretty happy with the meal at Bartolotta. 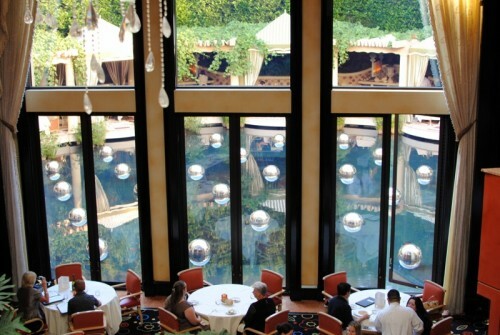 It’s a beautiful looking restaurant, and the food stood up to it. Seafood is done very well here, and in a variety of preparations. Some of the highlights were the risotto and lobster pasta, as well as the chicken and snapper. Next time, I will have to try one of the whole fish.